Record Attendance at 8th Annual LGBT Elders in an Ever Changing World Conference | Fenway Health: Health Care Is A Right, Not A Privilege. Record Attendance at 8th Annual LGBT Elders in an Ever Changing World Conference | Fenway Health: Health Care Is A Right, Not A Privilege. Record Attendance at 8th Annual LGBT Elders in an Ever Changing World Conference – Fenway Health: Health Care Is A Right, Not A Privilege. The 8th Annual LGBT Elders in an Ever Changing World Conference, held at Salem State University on March 15, brought together social workers, elder care providers, public policy makers, educators, researchers, and community members. The nearly 200 attendees – a record for the conference – gathered to learn and discuss interdisciplinary best practices and policies for working with lesbian, gay, bisexual and transgender older adults and caregivers. LGBT Elders in an Ever Changing World is a collaborative effort of the LGBT Aging Project, a program of Fenway Health; North Shore Elder Services and the Over the Rainbow LGBT Coalition; Salem State University School of Social Work; Care Dimensions; and AARP Massachusetts. 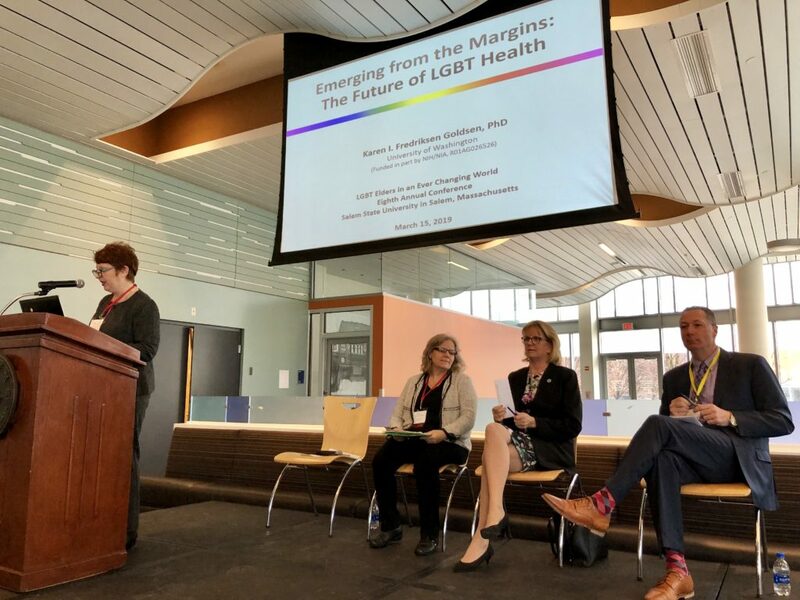 The day featured speakers from across health care, research, and social services, including Lisa Krinsky, Director of the LGBT Aging Project, Bob Linscott, Assistant Director of the LGBT Aging Project, and Sean Cahill, Director of Health Policy Research at The Fenway Institute. Karen Fredriksen-Goldsen, Professor and Director of Healthy Generations at the Hartford Center of Excellence at the University of Washington, delivered a spirited keynote on the future of LGBTQ aging. CEUs were offered during the conference for social workers, certified case managers, and nurses. Conference sessions covered a wide range of topics, including aging wth HIV, LGBTQ-friendly senior housing, transgender older adults, end of life care, creating LGBTQ-themed senior center programming, building LGBTQ elder online communities, sexuality and aging, LGBTQ education for non-LGBTQ seniors, and federal aging policy.